I’m going to let these pictures do most of the talking on this one. Go Utes! I picked up a copy of Killer Bunnies for my birthday after I read a copy of the rules at Kara’s place (one of her roommates had it). The game play seemed unique, and now that I’ve had it out and played it with various groups of people, I can say that it is fun. Almost everyone that I’ve played it with have enjoyed it. Flo still hasn’t come through for me. Bang! was another game that I really really liked a lot this year. I got it for my sister for Christmas, and enjoyed it so much that I got it for myself. I selected one individual game as my top 5. We were playing at my apartment, at some point midsummer, and I had drawn the Renegade card and Chalsea had drawn the Sheriff. Somehow, I had managed to knock off a whole bunch of players in a very short time frame, effectively tipping my hand as to who I was. Somehow, it came down to a shootout between Chals and myself. I kept drawing cards that would keep her from shooting me, which was fortunate. In the end, I shot her and won. It’s very hard to win as the Renegade, so it was memorable. Another one where I’ll let the pictures speak for themselves. Ok, so Settlers of Catan will probably always be my favorite game. This year has been a great year for Settlers. I’ve had a great group of friends who like to play, and who make for a great game. The rivalries between Jonathan and myself, and between Jonathan and Mike, (Wow, Jonathan, lots of rivalries. What does that say?) have been epic. The victories have been sweet, and the defeats have been bitter. The occasional food has been delicious. I’ll admit that I even had to go buy two more chairs specifically so that I have enough seating for Settlers at my house. In short, I pretty much love Settlers of Catan. No one has actually made a Settlers of Catan pizza yet, but now that I think of it, I don’t see any reason why this wouldn’t be a good idea. So there you have it. My favorite games of 2008. What were yours? I want to wish all of my friends a very Happy Christmas and a joyous New Year. As I’ve been compiling my year end lists, I’ve realized how much each of you have influenced me for the better this year. Thank you! 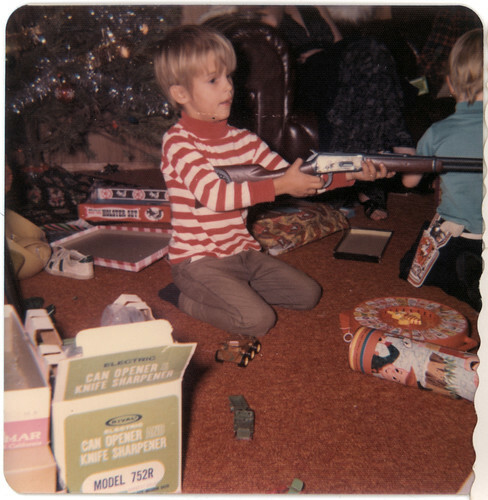 Happy Christmas and don’t shoot your eyes out! This retrospective is probably one of the more difficult of the ones that I’ve written so far. I enjoy my music, but I don’t really think about it so much. How do I go about choosing my top 5 list for this one? I decided to broaden it to things that I listen to… that made my list making easier. I’m going to try to figure out how to make one of those embeddable music thingies too. Of all of my podcasts, I’m glad I started getting this one. I’d caught episodes here and there, but never with a concerted effort. For a while, my favorite run was on Monday night because I could listen to the new TAL podcast. I began to consciously avoid driving while TAL was on, so I could listen to it while running. My best TAL story was of me running a few days after Halloween on a dark and deserted road, and then having a story about rabid raccoons come on. On that run, I was later terrified by an opossum with beady little red eyes. My old go-to Pandora Playlist. (You can listen to it at the link back there.) When I’m busy at work, and I need to focus, I pull up Pandora and set it to this playlist. I’ve got it so well trained that it only plays me music that I will like. Unfortunately, that means I don’t get any new music anymore. (See #2 below). I really don’t know why, but I can’t listen to enough of Ronnie Day’s music. Most of my playlists include at least one of his songs right now. I don’t really know what else to say, other than you should listen to some of his work. My new go-to Pandora Playlist. (Again, you can listen at that link). I got a little tired of my AltRock Mix Tape, after I trained it so well. So I seeded this list with The Decemberists, Ben Folds, and the Killers. It’s a pretty good playlist. My Power Song on my iPod+Nike system. I’ve learned that it’s worth a good half-mile at a decent pace, especially right at the end of a run. And it will move me. According to both Last.fm and iTunes, this is the song I listened to the most in 2008. So there are my Top 5 Listenings of 2008. Anyone else have any favorites from this year? I heard this song by Abigail Washburn and the Sparrow Quartet on NPR and rushed home and bought the whole album. It’s Bluegrass meets Traditional Chinese folk music. It’s really quite awesome. Ok, I think I figured out how this works. I’ve added a handful of the songs that I mentioned here, plus some that got thumbs up on my Pandora playlists, plus some that Last.fm and iTunes say that I listened to a lot this year. Enjoy! As well established readers of this blog will know, I enjoy cooking. So what retrospective of 2008 would be complete without a list of recipes that have influenced me this year. I’ve tried out a lot of new recipes this year, and these are the ones that I loved the most and wanted to share with you all. Amy made this recipe for one of our regular get-togethers to play Settlers. I loved the recipe so much that I tried and failed to replicate it by myself, and eventually just broke down and asked Amy for it. With my CSA this summer I had no dearth of zucchini and summer squash, and this became an easy dinner recipe that I relied on time and time again. This recipe is very easy to both scale and tweak. Add extra little bits of whatever you’ve got (ham, cheese, other veggies, whatever) or vary the spices and you’ve got a completely new experience. In a large bowl, combine zucchini, egg, and butter or margarine. Stir in seasoned crumbs, minced onion, and seasoning. Mix well. I blogged about Amy blogging about these cookies. I’ll refer you to her recipe for the details, but these are far and away the best cookies you could ever make. Ok, maybe I’m gushing, but this recipe sings. And instead of hoarding the recipe to herself, she shared it! And now you can try them too. I’ve made them several times and they’re great. I’m a cranberry geek. 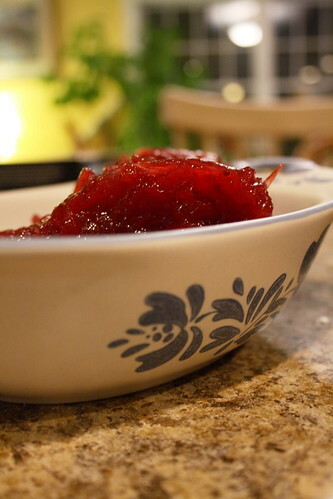 I love cranberry sauce, but its very rare for me to get well prepared sauce not from a can. (Has anyone ever gotten good stuff from a can? I don’t know!) For Thanksgiving this year, I decided that if I wanted good sauce, I would have to make it myself. So I did. And it was good. I trialed the recipe twice, and got slightly different results, but the outcome was great both times. Bring water and sugar to a boil, dissolving sugar. Add orange juice and cranberries. Return to boil (It’s hard to tell, because there are now more cranberries than anything else in the pan, and not terribly important, just get the temp back up). Lower heat to a gentle simmer. Cranberries will start to pop. Cook for about 10 minutes, until the cranberries have softened and the liquid starts to gel. Add zest and spice to taste. (I just dumped it in, I didn’t measure… probably 1-2 teaspoons.) Mix on the heat for another minute or so. Remove from heat, pour into serving dish. The gel will harden as it cools. When it has come to room temp, put in the fridge until showtime. My first go with the recipe, I simmered for less than 10 minutes, and the berries were more whole and the gel less firm. The second round, which I brought for dinner, I simmered a little longer (I wasn’t paying attention), and it worked out fine, and set up a lot harder. When I went out to Salt Lake this spring, I surprised my MBA friends. They’re always inviting me over to dinner, but rarely give me enough advance notice to get out there. This time I told them I’d go (which was the part that surprised them!). Jodie was hosting the dinner, and since I was staying at her place, I weaseled my way into helping make it. Or mostly watching Jodie make it. 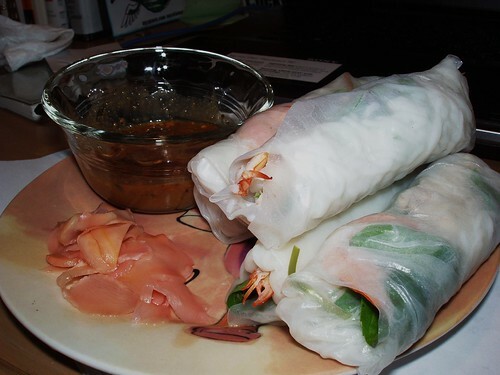 The appetizer course was Spring Rolls, which are fancy and very simple to make. I later hosted people for a roll your own dinner, and also forced them upon my family over the 4th of July. I think I ended up taking them to a mingle as well, except I called them Summer rolls. This is another recipe that is very customizable to whatever you have available. 1. Moisten rice paper by rubbing with water, or dipping in hot water for a few seconds. Let stand a few moments until softened. 2. On the bottom third of the rice paper round, make a small pile of rice noodles, a few shreds of meat, half a shrimp, some lettuce, carrot, and a leaf of each herb. 3. Roll up the rice paper over the filling, taking it halfway up the uncovered portion of rice paper. Now fold in the side flaps and continue rolling until you have a tight cylinder. Put on a plate and keep covered with a damp cloth. You should serve these with dipping sauces. One easy dipping sauce is Sweet Chili sauce, which you can find in most Asian sections at the grocery store. Another easy sauce is Peanut Sauce. In a small sauce pan, add 2 parts peanut butter (natural and chunky is the way I like it!) to 1 part hoisin sauce (another Asian section staple). Heat it up a bit while stirring. When it seems well mixed, add some coconut milk or water (or both) to thin it down. Whisk vigorously and serve. I love this next recipe. I’ve blogged it before, but I’m going to go ahead and put it here again. Because I love it that much. And because you probably won’t click the link. I discovered this in my How to Cook Everything Vegetarian cookbook (by Mark Bittman), when Melanie, Leilani, and I were having one of our Vegetarian cooking nights. We did Baked Garbanzos with Fresh Cheese and Spinach (basically a fancied up saag paneer). But this sauce was the star of the show. I’d make this for dinner every day if my stomach wasn’t so sensitive to tomatoes. 1. Put 3 T of the butter or oil in a deep skillet over medium0-high heat. When the butter is melted or oil is hot, add onion, garlic, ginger and chile. Cook, stirring occasionally, until onion is soft, about 5 minutes. Stir in garam masala, chili powder and sugar and sprinkle with salt and pepper; cook and stir until spices become fragrant, a minute or two more. 2. Add tomato and cook, stirring frequently, until it starts to release its liquid, about 3 minutes. Add the cream and cilantro and keep cooking and stirring until the mixture comes to a boil. 4. Put remaining butter or oil in a small pan over medium-high heat. When the butter is melted or the oil is hot, add cumin and mustard seeds and toast them until they begin to pop. Spoon over the sauce just before serving. Bonus #1: My favorite new spice: Garam Masala. Technically, a mixture of spices, garam masala is an Indian spice, which packs such an incredible punch of flavor. I had been using my own mixture until I realized there is an Indian grocery just down the road a bit. I found it, and I’ve been finding ways to use it ever since. So far, I have seasoned my Thanksgiving backup ham with it and a lentil soup. I’m looking forward to the other ways that I can use it! Bonus #2: A Christmas cookie recipe: Rolo Cookies. I got a great response to these on my cookie trays, and thought I’d share the joy. Clicky the linky above. Mmm! So there you go. My favorite recipes of 2008. What are yours? To round out the year, many of the blogs that I read are doing their year in summary posts these days. I thought I’d follow suit. I’ve compiled several lists of my favorite things from 2008. I think that it will provide a welcome relief from other recent subjects. This first list is rather broad. I’m counting anything that I watched, on a big or small screen, for the first time in 2008. And basically, it’s just the 5 things that stand out in my mind. I probably forgot more than I remembered. I had people over to watch this classic Hitchcock film, after asking Brian of Brian Presents fame for some recommendation to spice up my Netflix queue. The Carousel scene haunts me to this day. Another Brian Presents entry. This was my initiation into the world of silent films. I laughed, I cried. Iron Man proved a point to me. Don’t always believe the critics. I had heard a scathing review on my way home from work, and had no intention of seeing it. Fortunately, somehow I managed to stumble across the Rotten Tomato index for the movie. It was a stunning 93% fresh. Apparently, the poor review that I’d heard on NPR was the only bad review. It was a fun fresh movie. I’ve already talked this one up. It was so clever and witty that it inspired me to dress as Dr. Horrible for Halloween. If you still haven’t seen it, check it out at Hulu.com. 1- The Constant, LOST season 4, Epsiode 5. Hands down the best episode of LOST, ever. EVER. I don’t even know where to begin. The whole Desmond / Penny plotline is one of the most wrenching, raw, real emotion parts of the show, and the story, the directing, and the acting all came together in one beautiful episode. If the rest of the show fizzles out (highly unlikely), The Constant will have made the whole series worth it to me. I’m not one to cry, but of all of the shows I saw this year, this one brought me the closest to tears. You have to be well grounded in Lost lore to really understand this episode, so I won’t put a clip. If you aren’t, you should be. I think ABC.com is still streaming all of the episode from all of the seasons. Go! Now! Heroes Season 3. The plot is rambling all over the place. Foreshadowings are ignored, characters are taken down inconsistent paths. I watch, and I hope they tie a nice bow on it, but it doesn’t happen. What happened to Heroes, Season 1? That was awesome. So there you go. My top 5 Moving Pictures for 2008. What are yours? It is a fairly well kept secret that I really enjoy dancing. Mostly because the only dances that I usually have any association with are the frenetic, frantic, mostly arrhythmic, awkward “Mormon Singles Dances,” which I kind of hate. Unfortunately, I think my cover is blown as of last night. I have been pointedly avoiding these types of dances for the last four years, ever since I moved from Laramie to Salt Lake. At some point, they became very unpleasant for me. I was speculating last night that it had something to do with when I became fat and lazy in Salt Lake and my endurance took a nosedive. My interpretation of this kind of dancing requires a whole lot of energy and staying power, which I didn’t really have in Salt Lake. Add to that the whole “Make a fool of yourself in front of people that you barely know and maintain at least some hope of asking out on dates,” and it was a recipe for disaster. I have been pointedly avoiding the Hill Street Soiree for the last few years. My first year, I really didn’t know people well, and my second year, I may or may not have purposely procrastinated writing a talk to have an excuse to leave before the dancing got underway. Some background, I think might be in order. The Hill Street Soiree is what some might call a Big Deal. This is the one Hill Street Ward activity each year to end all activities, quite literally. The Soiree, in its 8th incarnation last night, is a semi-formal dinner dance held in December each year. The HSAC goes all out: a catered dinner, a marvelously decorated space, and lots of music to dance the night away. The other singles wards in the area are typically invited to the dance (We’ve selfishly kept the dinner to ourselves in the past.) This year, it was an official multi-stake activity, and much better attended than the other activities this year. At some point, my resistance cracked. I ended up on the dance floor, and I. Had. A. Blast. I couldn’t stop. My endurance has been finely tuned over the last year, to the point that a 9 mile run seems challenging only in trying to find 9 miles to run it in. I couldn’t use that as an excuse. The headache that I had been planning to use as an excuse went away. I had nothing. I tried to leave early towards the end of the dance. That didn’t work. I got sucked into a few dances that I couldn’t avoid dancing too (such weak will power, must… keep… dancing…) and suddenly it was the Last Dance. I’m principled enough to not skip the last dance. That’s just bad form. But suddenly, my chances of showing the front that I don’t like dancing was clearly gone. After all, I had stayed to the end, and ended it on the dance floor. Ah, well, at least we got to dance to the Numa Numa song. I’ll add some photos once I can steal some from Facebook. Strangely, by 10:30 the day after the Soiree, no pictures have turned up yet. Most people can safely ignore this post. This post has two purposes. My sister asked me what I want for Christmas, so I checked my wishlists, and came up with some things to kind of give an idea. 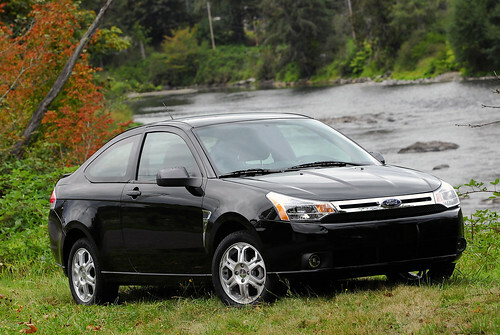 (I’m notoriously hard to buy for, I think.) Obviously, this list is pretty heavy on the book side, but it gives an idea of what I’m thinking about.